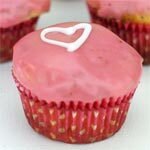 Here's all the recipes listed under Healthy Baked Goods along with the comments posted by the breakfast lovers that submitted them. "These are terrific served fresh and warm. You get the great taste of walnuts and dates in every bite." "I've tried variations on this recipe using both oat bran (same amount) and wheat germ (1 cup) and both were good. Experiment with your favorites." 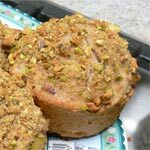 "Apples, dates, nuts (if you want them) and a healthy pinch of cinnamon and allspice combine to make muffins with an almost holiday-like flavor." "These store well in the refridgerator for a week. In fact, I like them best out of the refridgerator when they're a little cool." "We love these warmed up just a little in the microwave." 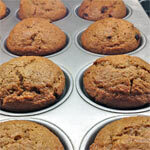 "Moist and delicious muffins loaded with flavor. You could replace the buttermilk with regular low fat milk. It's still good, but not quite as great. Same thing with replacing 1/4 of the flour with whole wheat flour." "Brown sugar and bananas... Is this a muffin or a delicious bite of banana pancakes in my mouth?" "Delicious and pretty healthy. You can replace the milk with soy milk and it still turns out great. I've been meaning to try vanilla soy milk. I'll post here if I do. Enjoy!" 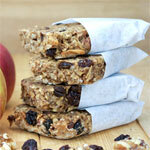 "Great for a quick breakfast or for an afternoon snack. If using frozen blueberries, be sure to thaw them completely and drain off any excess water." 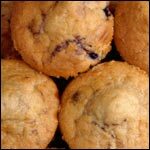 "Healthy muffins with lots of lemon and blueberry flavor." 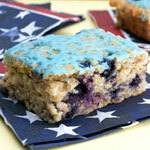 "Kind of a cross between a coffee cake and a breakfast bar. Each serving has about 150 calories. Enjoy!" 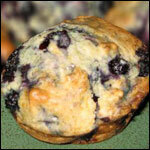 "These scones use dried blueberries so you can make them anytime you want. You bring the berries back to life by soaking them in water for a few minutes." "How can something this healthy taste so darn good?! 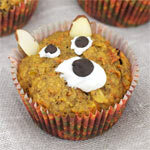 The bran and flax are playfully offset by a surprising sweet citrus flavor from whole oranges." 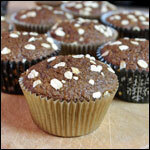 "The easiest bran muffin recipe I think you'll find. You can refrigerate the mix up to 6 weeks." "Very tasty and healthy to boot. Hope you like it." "Like butternut squash on its own, this muffin comes alive as soon as you add a pat of butter (or I like "I Can't Believe It's Not Butter"). A healthy and tasty treat." "Healthy and tasty. Awesome for breakfast... just warm a slice in the microwave for 15 seconds and top with "I Can't Believe It's Not Butter" spread. Mmmm mmm good!" 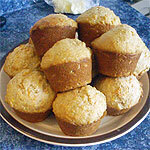 "These muffins use moistened shredded wheat biscuits as a major component. Freshly grated ginger adds a unique flavor." "Good old fashioned (mostly) whole wheat bran muffins with raisins, walnuts and a touch of cinnamon, vanilla and orange zest. Dare I say, they're bran-tastic!" 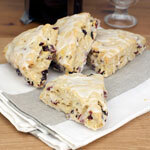 "Tangy, sweet and delicious scones with orange zest and cranberries. Absolutely fantastic to have with your morning tea or coffee!" 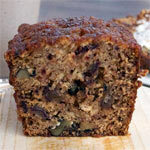 "Banana bread is great, but Cranberry Banana Bread is Super Great. Hope you like it as much as I do." "This is a delicious, low fat treat for the morning after Thanksgiving!" 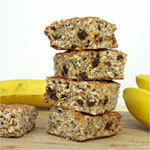 "What makes banana bread even better? Dark chocolate chunks and toasted pecans!" 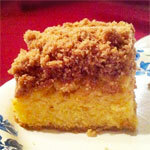 "You won't miss the egg in this coffee cake recipe. Flax seeds mixed with water acts as a binding agent in place of an egg." "If you don't have baking rings or egg rings, small tuna cans with tops and bottoms removed work well." 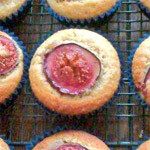 "A healthy low-fat muffin with bran cereal and figs as the main ingredients." 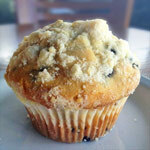 "Muffins designed specifically to provide ideal nutrients for breastfeeding mothers." 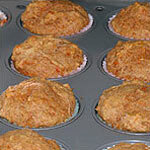 "These muffins get an extra burst of nutrition and flavor from grated carrots and/or zucchini. 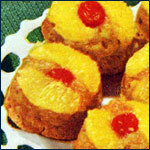 You can adjust the recipe by using the fresh or dried fruits you most prefer." 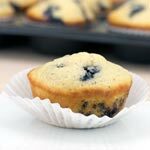 "A healthy and gluten-free version of the classic blueberry muffin in reasonable, diet-friendly portions." "These bars freeze well. Wrap leftover portions in plastic wrap or aluminum foil and store in freezer for up to 2 weeks. Each bar has about 170 calories and 7 grams of fat (1.5 grams saturated fat)." 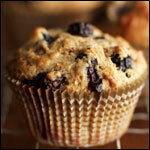 "A berry delicious and berry healthy muffin recipe. Makes 18 muffins. Prep Time: 10 minutes. Bake Time: 20 minutes. Recipe courtesy of Driscoll's Berries." "An egg-free recipe with a dense healthy texture and lots of good maple flavor." "This is a very flexible recipe that can be adjusted to your individual taste using your favorite spices, nuts, fruit and yogurt." 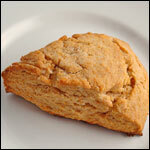 "Combine remaining yogurt with cream cheese and serve with warm scones. " "Please be sure not to over-stir the batter or the muffins so hard they will be banana chocolate chip bricks!" 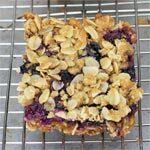 "This recipe works best with fresh berries, but you can use frozen blueberries as long as they're mostly thawed." "These are delicious and you don't miss the fat! 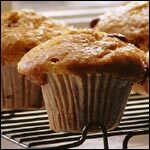 Each muffin has only about 1 gram of fat if you use the egg substitute!" "You can add fillers (raisins, fruit pieces, etc.) or press nuts (almonds, pecans, etc.) onto the top before baking. A family favorite!" "This moist and flavorful bread is wonderful topped with low-fat cream cheese or with a light smear of butter." "These are best served warm. I make a whole bunch and then put one in the microwave for 30 seconds whenever I want to make a quick treat." 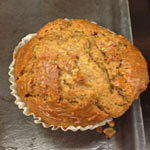 "A healthy and tasty muffin. You can use plain bran flakes cereal and a handful of raisins if you don't have Raisin Bran cereal around." 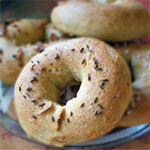 "Now you can make freshly baked morning bagels with a gluten-free bread mix. This recipe include three easy variations to make specialty bagels too." "Each mini granola bar has approx. 100 calories and 4 grams of fat." "Delicious and hearty with grated carrot, raisins and shredded coconut. 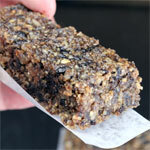 Whole grain oats and wheat germ add a healthy dose of fiber." 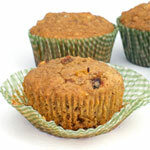 "With these muffins, you get fiber and whole grains from oats, wheat flour and the secret ingredient, All-Bran breakfast cereal. Flavor from pineapple and walnuts makes you forget this is healthy." 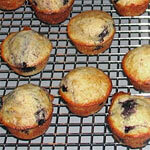 "This recipe makes a dozen muffins. 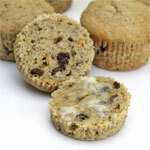 As far as delicious muffins go, this is a fairly low-fat recipe (no butter)." "Use day old cinnamon swirl bread from the discount rack at the bakery. It's half the price and absorbs the egg mixture for a better consistency! " "Gary Collins' intro for this recipe in The Hour Magazine Cookbook reads as follows: "I knew about Tim Reid from WKRP In Cincinnati and about his current role on Simon & Simon, but I didn't know that Tim is a fitness freak with an affinity for health foods. 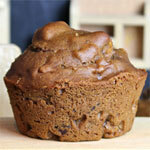 Here he offers us a quick and healthy molasses bread!" TV fans know Tim Reid best as the character DJ "Venus Flytrap"." "You can use other Raisin Bran type cereals. It's a fun recipe to experiment with." "Very simple recipe. Best served warm & buttered. Also very good with sliced cheese on top." "Best served warm with butter and your favorite jam or preserve." 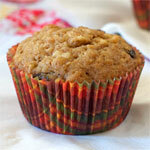 "Bran muffins are both tasty and an excellent, healthy source of fiber." "Each serving has 326 calories and 9 grams of fat (4.9g sat.) To reduce the fat, you could use egg whites or egg substitute." "Your friends will be surprised to discover that these are baked, not fried. 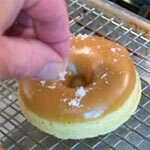 It�s a gourmet donut experience that's as easy and quick to prepare as muffins. A donut baking pan is required." "This recipe by 8 year old Jalaine Park took 1st place in the breakfast division at the 3rd Annual Kids Kitchen Corral Recipe Contest sponsored by the Texas Department of Agriculture." "The secret ingredient is All Bran cereal that's crushed and mixed into the batter. 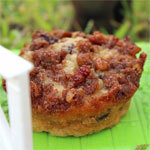 Dried cherries give this coffee cake a unique flavor." 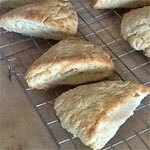 "Although the recipe says this will last for six weeks, I've never had them last that long. We've eaten them all up long before then! Sometimes the batter will have a fermented look. Not to worry. That's normal. Enjoy!!" 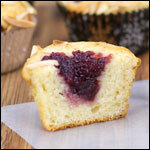 "These buttermilk-based muffins use low-fat cream cheese and strawberry jam to provide moistness and creamy berry flavor." 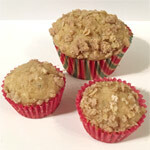 "Hearty and healthy muffins made with whole wheat flour and oat bran. The flavor comes from grated carrots, maple syrup, cinnamon and all-spice." "If you want more vanilla flavoring, add 1 TSP vanilla to wet ingredients. Enjoy!" "You can cut this into whatever size bars you would like. I cut it into fourths for meal-sized bars. Believe me: they have real staying power! Enjoy!" 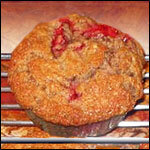 "Juicy-fruity bran muffins... a taste-good dish that's good for you! From a classic magazine ad for Nabisco 100% Bran." "This coffee cake uses soy milk and egg substitute so it's vegan. Apple sauce adds moistness to the batter. 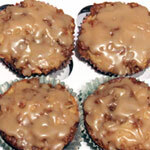 A cinnamon and brown sugar crumble acts as the perfect topping." 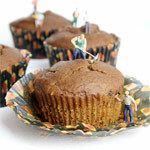 "A really simple recipe with lots of pumpkin flavor thanks to an infusion of all the spices we equate with pumpkin pie." "With about 175 calories and only 1 gram of fat each, these scones are a delicious, more-healthy substitution for those inevitable apple fritter donut craving we all have." 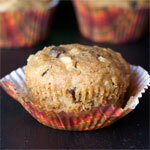 "A healthier banana nut muffin thanks to whole wheat flour replacing most of the all-purpose flour and olive oil replacing the butter." "Read the special comments for a great even-lower low-fat version."